ANGEL'S PUPS ARE ALL ADOPTED. These will be 5-7 lbs. when full grown. They are so pretty and have sweet personalities. 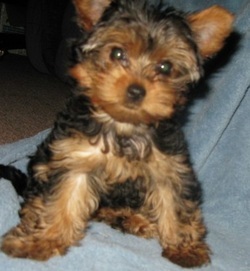 Wouldn't you love to have a puppy like this? They will have beautiful coats, dark blue with gold markings. Excellent, outgoing personalities, and potty training is started. All puppies come with their first shots, de-wormed, Vet's Health Certificate. The boys have found pet homes. One girl, Dell, has been placed in a co-owner home, and the smallest girl, Bella, has found her forever home with Jo-el. This is Bella. She's a love. She is 6 months old and weighs about 4 lbs. now, and may possibly grow to 5 lbs. The sweetest thing, she likes to beat up her dad, Danny, but is a real cuddler girl and likes to be held, and cuddle on the bed. She's been adopted. This is Bonnie. Sorry, she's been adopted. Pups are home raised with cats, dogs, and kids. It makes a difference. Please don't buy from a pet shop or puppy mill. Hi I'm Kelly. Sorry I'm already adopted, and gone home with Stacy in Pa. Isn't she sweet! What a nice personality, full of love and kisses. Crate training and potty training started. Angel and Danny's previous litter is pictured below are at 4 weeks old. Sorry, these cuties are taken. 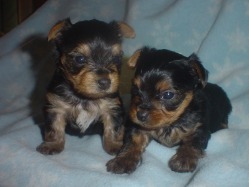 These beautiful Yorkie pups are only 4 weeks old in this picture. These are the 2 smallest boys, they both have a white spot on their chests, but that will blend in when their true silver/blue coat comes in. They will have nice dark tan markings. 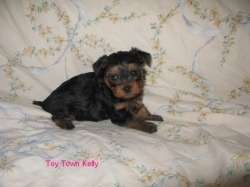 The one on the left "Teddy" will have lighter markings and will be approximately 5 lbs. He's a beauty! The one on the right "Dakota" will be approximately 6-7 lbs when full grown. What a super puppy! This is Romeo. He's a beauty! Wonderful personality too. He has found an excellent home. 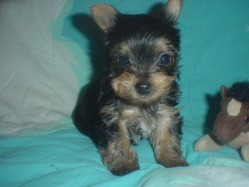 He looks very cute, a terrier type like his dad, Danny. I love this puppy! This is Teddy Bear. He's the tiniest one! What a doll! You could dress him up. Update: He's found an excellent home. 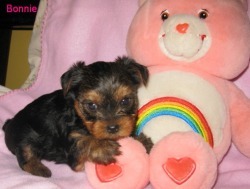 "Teddy Bear" is the smallest in the litter. 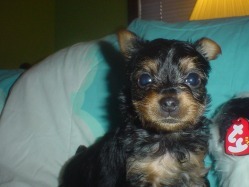 He will be approximately 5-6 lbs. lbs. when full grown. He's a very special puppy, so sweet and cuddly! He loves kids and wants to play gently! Please email for more info on a future puppy who will look just like him!